Happy World Card Making Day! I managed to get a card made this year, even though Saturdays around here are NUTS. I’ve wanted to use Essentials by Ellen Home and Hearth for a while, but when I saw the Sketch Challenge on the Ellen Hutson Blog, I knew it was perfect for this! 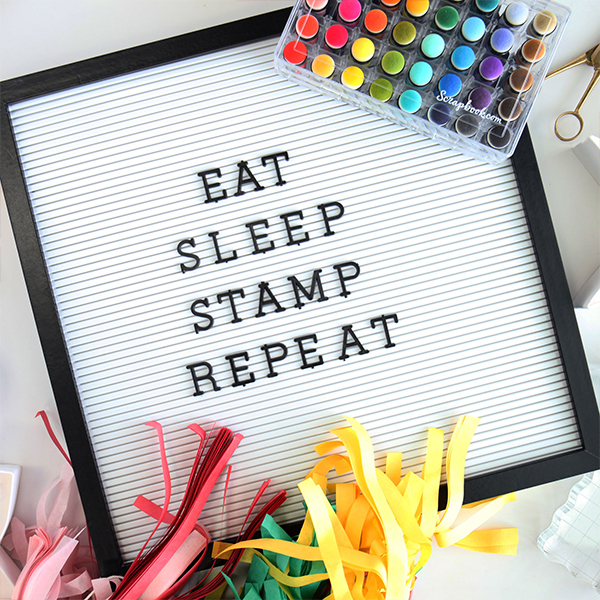 And there’s a chance to win some sweet stampin’ cash! GOJUS! Originally, I was going for a snowy night sky, but the colors bled into each other in such a way that it became a galaxy instead! I ended up grabbing my FineTec paints and spattering some of the white on to enhance that effect. I die cut the circle once out of the watercolor piece and again out of some Neenah Solar White 110 lb, which I then used MFT Stamp’s Snow Drifts dies to cut a couple of pieces for the ground. I used the little house dies with the same cardstock, and used the trees, stars, and hearts on other areas of the watercolor piece. I then adhere all of it together and added some Clear Wink of Stella on the stars and added some smoke with a Sakura Stardust pen. This greeting is from Cozy Christmas, which I found out today was retired! Wah! I stamped in Versafine Onyx Black and heat embossed with clear EP. I added one of the die cut hearts next to it. It turned out really beautifully, much cleaner than I usually do, but it was fun! And be sure to head over to Ellen Hutson for their WCMD special!